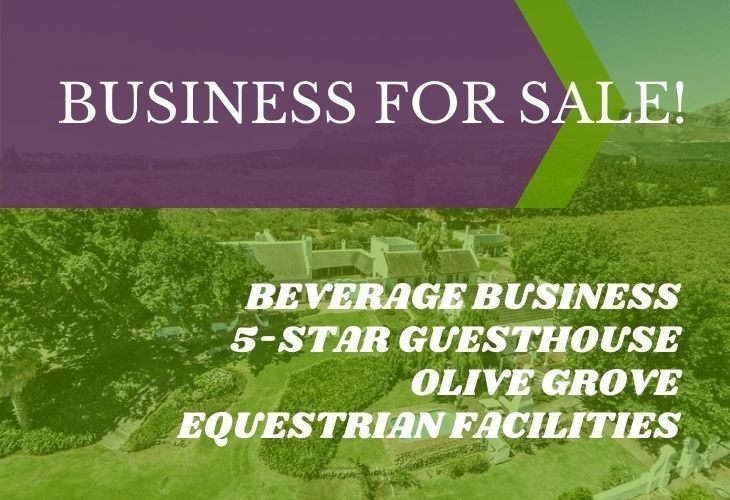 A 2,4-hectare Lifestyle smallholding in Teselaarsdal in the Overberg. It has 100m river frontage on the Kleinrivier. This small holding is zoned agriculture & the rates for 2018 was R843 per annum. 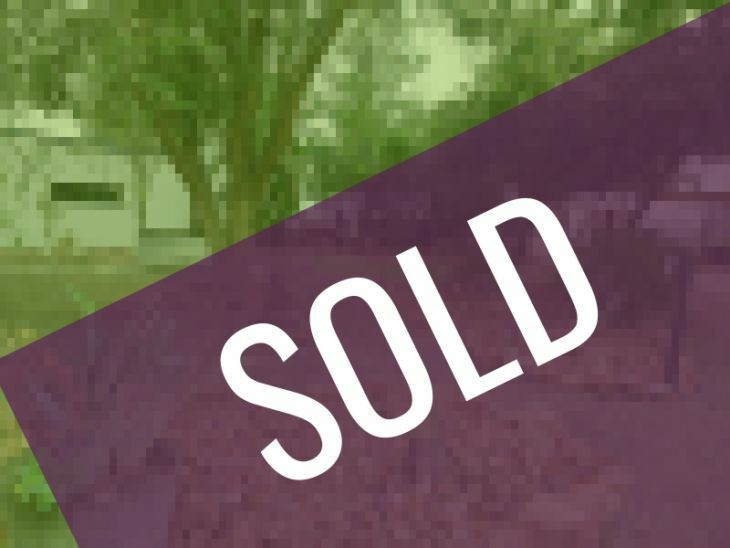 House with 1 main bedroom, second bedroom in the attic, bathroom, kitchen & lounge with a beautiful fireplace for those cold winter days. Approved plans for the house to be extended to 187 sq meters. Two 3x3m wendy houses with an outside bathroom. 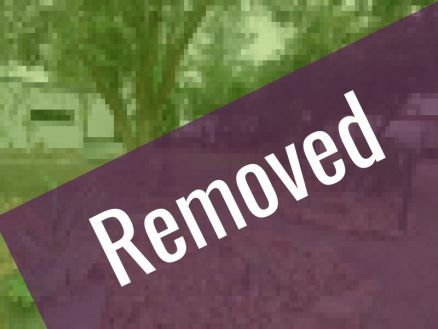 Access to the property is via 2 municipal roads, so no need for servitude roads. Full alarm system and burglar bars on all windows. A stoep with very useful pizza oven. A fully function irrigation system to the vines, olive trees and other fruit trees. Combined table grape and fruit farm for sale with the possibility of expanding. The water on this farm is also very secure, even in the dry times. A Home, A Business A Farm - all of these apply.. Situated on the eastern foothills of Paarl Mountain with views of the Drakenstein Valley and its majestic Mountains, it combines a lovely home, self catering accommodation and operates as a function venue. There 8 fully equipped guest cottages, a fully equipped farm house (12 sleep) and a Prime cottage (8 sleep) . Each 2 bed roomed cottage sleeps 4 to 5 guests. DSTV, Braai facilities and swimming pool are available with a swimming pool. Air-con & WiFi is optional. Generating an average income of R120,000-00 pm This property is only 56km from Cape Town International Airport, 30km from Stellenbosch, 28km Franschhoek and within a 70km range of beaches such as Strand, Bloubergstrand and Melkbosstrand. World famous Golf courses Boschenmeer and Pearl Valley are on your doorstep, On the Paarl wine-route with its great restaurants, supermarkets,wine farms , historical buildings and wine cellars. A Farming Estate of Exceptional Quality with potential of a wine cellar and eco tourism destination. 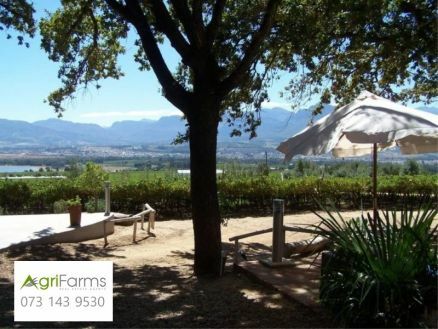 This magnificent farm is situated in one of the most fertile corners of Wellington, boasting top quality vineyards set in an outstanding terroir region. 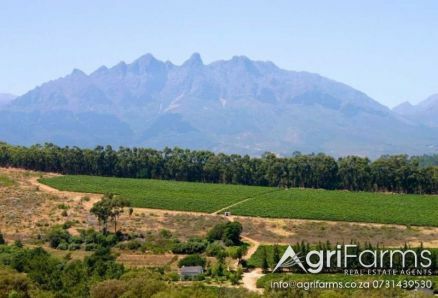 The 83 hectare farm is located at the base of Groenberg mountain offering 18 hectares under well maintained vines (various cultivars) with additional arable land for expanding on the existing vineyard plantations. 2 boreholes offer substantial amounts of water for irrigation purposes and water can also be pumped from the well-established river scheme. A dam higher up on the farm offers water from a fountain and its rain catchment area, which further supplies irrigation water. The old farm homestead, with a touch of TLC, offers a lovely country house sheltered amongst old oaks. The old shed with its handmade mud bricks and its original stone foundations could with careful restoration be converted into a boutique wine cellar. A delightful country cottage is situated a bit higher up on the farm and could be converted into self-catering guest house to cater for the high demand for accommodation in the Wellington winelands. Imagine waking up to a misty morning with the most breath-taking view of the majestic mountain ranges and valleys below. 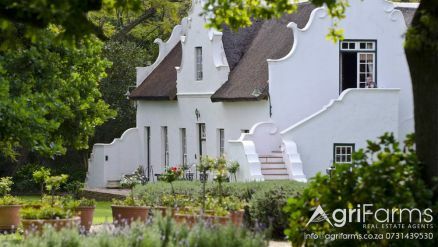 Situated in the heart of the Cape Winelands, this farm offers a unique perspective of the surrounding countryside of Wellington and frequented by tourists and locals alike with horse and hiking trails and an exquisite view of surrounding vineyards, olive groves, Buchu plantations and fynbos. The farm is at present being utilised as a lifestyle residence and has a nursery thats being revived with ample water supplied from a natural spring that is on the verge of the farm. There are about five hectares of a variety of proteas and fynbos species, a nature lovers dream and in the past, run by the previous owner as thriving protea dried and fresh flower export concern. There is an existing infrastructure for a vineyard for those who wish to create bespoke wines. Furthermore, it has a strong supply of borehole water and three phase municipal reticulation. Main residence: consists of a double storey double volume house with five bedrooms. office, kitchenette, two bathrooms, lounge. and Atrium. Second Residence: One bedroom. Kitchenette. Lounge. Bathroom.